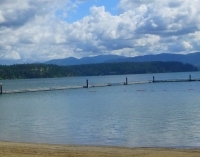 The Coeur d'Alene Indians hunted and fished this area undisturbed until Father De Smet arrived in 1846. After his brief time here, easterners coming west began to settle around the shores of the lake. In the 1870's, Mat Hayden, a veteran and a teamster, homesteaded a piece of property just west of Honeysuckle Beach. John Hager and John Hickey also moved to the area around the same time. Because the lake really didn't have a name, these three men played a poker game known as "Seven Up" to decide who could name the lake. Mat won, and the Lake became known as Hayden's Lake (1883) and after time the "s" was dropped to become just Hayden Lake. Around the turn of the century, logging operations flourished around Hayden Lake. Frank and Charles Wood operated a mill at Honeysuckle Beach. Another mill was north of the Bozanta Tavern, now the Hayden Lake Country Club, and yet another one was at Toe-Head Point. Two of these mills were later sold to what became best known as the Atlas Tie Co. During the logging era four steamboats were in operation on the lake. The Bozanta Tavern was a destination location for many tourists. In 1906, the electric railroad was extended from CDA to Hayden Lake to transport the tourists out to the Avondale Cottage and the Bozanta Tavern. In 1912, the Bozanta Tavern and Golf Course became Idaho’s first 18-hole course and was visited often by such people as President Taft and Bing Crosby. As logging, farming and recreation began to develop in the area, a small village emerged on the west shore of the lake. Monaghan’s store was located at Honeysuckle Beach, and moved to Avondale in 1906. The Greater Hayden/Hayden Lake area was known not only as a recreational destination, but also for its agriculture. Hayden grew legumes, wheat, oats, and hay, and was famous for the many orchard crops of apples, pears, cherries, and plums. The orchard crops led to the first packing plant which was built in 1914. The wooden box factory was built on the northern end of the orchards and was in operation from 1946-1990. In addition to agriculture, the greater Hayden/Hayden Lake area was known for its dairy, beef, sheep, chickens, pheasant, and even foxes; which were raised for their pelts. The last remnants of this era can be seen by the big red Stoddard Barn and the white Sims Barns, as well as, other smaller farm barns throughout the City. 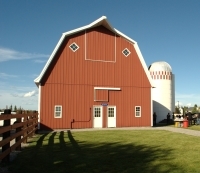 The newest barn was built in 2002 to be utilized as a training facility for horses. The 1st Post Office was located at Porter Point, then into Monaghan’s store at Honeysuckle Beach. But when the store moved, the Post Office moved to one of the cabins at the Bozanta Tavern and the name changed to Hayden Lake Post Office. Only after the post office moved to the Hayden Village in 1956 did it become the Hayden Post Office Education was important to the settlers of the area. Two schools were built around Hayden Lake: one on the east side and one on the west side. The students were called to school by the sound of a tea kettle as the school bell on the east side of the lake. Originally the students on the west side of the lake were to go to school in a new building (1887) near the Bozanta Tavern, however, before the building was used it was moved to the Hayden Elementary site. In 1907 this small building was removed to make way for a new 2-story school structure. And then again in 1936, this building was sold for $155 and moved to make way for the brick school that is still there today. The Village of Hayden was incorporated in 1955 with a total of 440 acres with a population of barely 700 people. Today the city totals 14653 acres and a population of nearly 15,000. 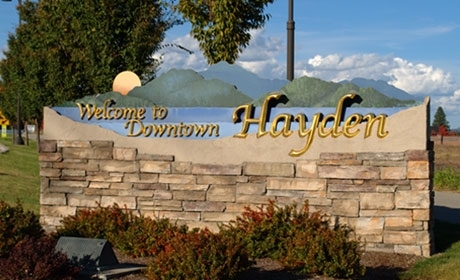 Copyright © 2019 City of Hayden, ID. All Rights Reserved.